A lovely original Egg chair by Arne Jacobsen for Fritz Hansen, double signed, with a foil label bearing a date stamp of 08 / 1967 and again on the underside of the base with the FH Made In Denmark stamp. Upholstery is in very good clean vintage condition and ready to be used immediately. We can steam clean prior to shipping upon request. No tears or issues to the fabric, only a few minor snags visible upon close inspection. Also a great candidate for reupholstery with new fabric or leather. The Egg chair was originally conceptualized for the SAS Royal Copenhagen Hotel, Denmark, which Jacobsen designed in it's entirety from the building itself to the flatware. This biomorphic club chair cradles and supports the human body while allowing for conversation or privacy. The Egg lounge chair stands on a cast aluminum four star base, offering 360° of movement and retains the original manufacturers stamp under the seat and under the base. 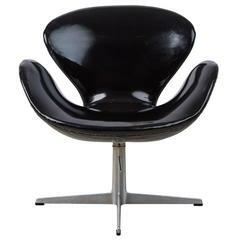 This swivel armchair is without an ottoman however we have a black leather Egg Chair and Ottoman if you are interested - contact us for details. This quintessentially iconic chair and ottoman would be ideal for anyone who appreciates Scandinavian design or wants a bit of "wow factor". It would look apt in a living room, study, family room, den, or screening room and be an excellent choice in a hospitality, retail or corporate location such as a boutique hotel lobby, cocktail bar, members club, workspace studio, executive office or in a luxe clothing emporium. Perfect gift for the consummate collector or interior designer. Measurements: 42" H x 35" W x 32" D Seat height 16.5" Seat depth 19.5". Upholstery appears to be the original fabric and is in very good clean vintage condition and ready to be used immediately. No tears or issues to the fabric, only a few minor snags visible upon close inspection. 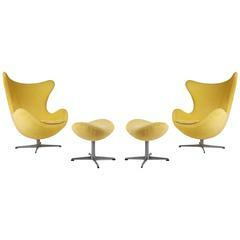 The iconic egg chair, model 3316, designed by Arne Jacobsen. 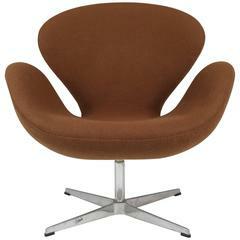 Produced by Fritz Hansen in Denmark, 1966. Newly upholstered in natural leather.